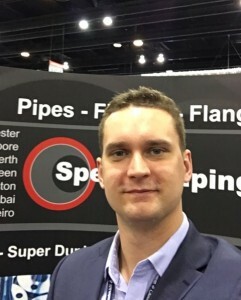 Special Piping Materials has appointed James Deeney as the new Business Development Manager in Houston, Texas. James’ primary objective with Special Piping Materials is to increase revenue by developing new opportunities on major projects within the Oil & Gas, LNG, Petrochemical and Water Treatment Industries. He brings with him six years’ of experience within the Oil & Gas Industry where he has supplied to Operators, EPCs and OEMs on large CAPEX projects. He originally spent three years in London where he concentrated on Greenfield North Sea Projects, and he supplied to Talisman Energy’s Montrose Area Redevelopment (MAR) Project, GDF’s Cygnus Project and BG Group’s Jackdaw Project. During this time he also worked with numerous international EPCs and Subsea EPICs. The appointment is an indication that Special Piping Materials is committed to investing in its workforce and is continuing to grow, despite the current climate in the oil and gas market. Daniel Composto, Director of US Operations, explains: “We believe that investing in our people is just as important as investing in our products and we will continue to do this to ensure that we are providing our customers with the best possible service. This appointment demonstrates that we are maintaining a strong position in the industry despite the challenges that it is currently creating.